American students aren't the only young people feeling the crush of student loan debt. British college grads carry an average $25,000 USD worth of debt after graduation, just $2,000 shy of their American comrades. 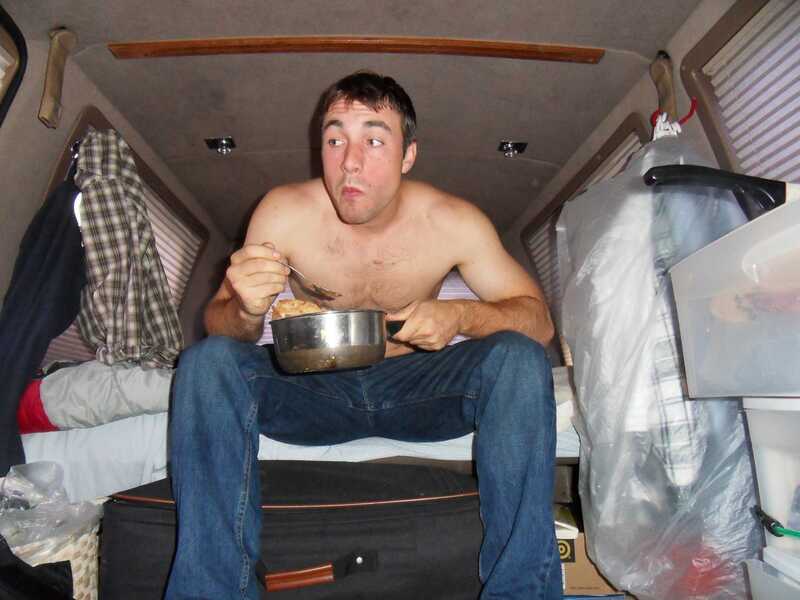 To escape falling into a similar fate, UK native Joe Pearce, 23, took extreme measures to stay debt-free while attending graduate school â€” he lived on a boat. "There was no financial back-up plan." Pearce, who studied hydrography as an undergrad (the science of mapping bodies of water), managed to pick up the tab for his Â£10,500 ($16,000 USD) degree on his own, in part thanks to a hotel that gave him free lodging in exchange for work. "Most people have parents for financial support, but my dad lost his sight with multiple sclerosis and he used to be the breadwinner, so there [was] no financial backup," he said. The plan after graduating was always to go for his Master's, but Pearce was determined not to go into any debt. That meant finding a way to take care of the Â£3,700 ($5,700 USD) cost of the program. Making matters worse, he'd just broken up with his live-in girlfriend. "My girlfriend and I shared rent of Â£100 ($150 USD) per week, so when we split, I was left with Â£400 ($600 USD) a month," Pearce said. "I [knew I] wouldn't have enough to finish my Master's." The Golden Cloud was a fixer-upper. Pearce's love for water was practically genetic. He grew up on the Isle of Wright and studied in the seaport town of Cowes, well-known by locals as the international home of sailing. "I've always had a soft spot for the sea, and [boating] is in my heart," he said. "My best memories as a child were ... going out on my dad's boat, kayaking around the coast and estuaries of the island and visiting my grandpa in Cornwall with his moorings and boats ... So I wondered, what if?" If he could actually make living on a boat a reality, he'd have to find the right vessel â€“ at the right price point. 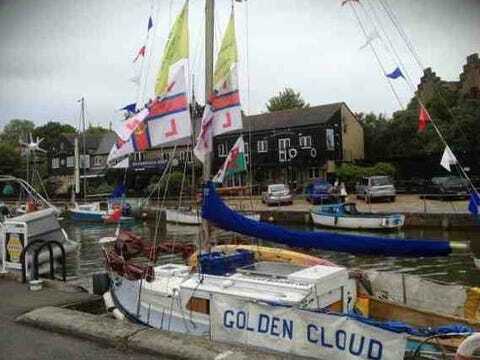 He hit the Web, eventually coming across a 23-foot sailboat named The Golden Cloud. The owner wanted Â£3,000 ($4,600 USD) for her, but Joe managed to barter the price down to Â£800 ($1,200 USD) â€“ just about the cost of two month's rent. The Golden Cloud wasn't exactly a luxury yacht. The Golden Cloud was built in the early 1970s and it didn't take long to show signs of age. It leaked on rainy days and was rotted in spots. At its tallest point, the cabin reached five feet, so Pearce, who clocks in at just under six feet tall, spent much of his time crouched down. "It's like camping in a wooden tent that can float," Pearce said. "It's really not a babe magnet, not with the rot and mold and half-finished wooden tables and tiny bunks." For the price of Â£1 ($1.50 USD) a day, Pearce moored his boat at a UNESCO nature reserve, saving hundreds on the cost of docking in a nearby marina. He relied on his neighbors to teach him how to "control the beast," helping to fix leaks and deal with mechanical problems. Pearce crouches in his tiny "kitchen" aboard The Golden Cloud. "On a sunny day it was a lovely place to be," Pearce said. "On a rainy day when it [the boat] was leaking from the ceiling and there was condensation inside, you don't really want to be there." There were other drawbacks to life at sea. Pearce was eight miles away from campus and bicycled the distance every day to avoid the costs of fuel or public transportation. 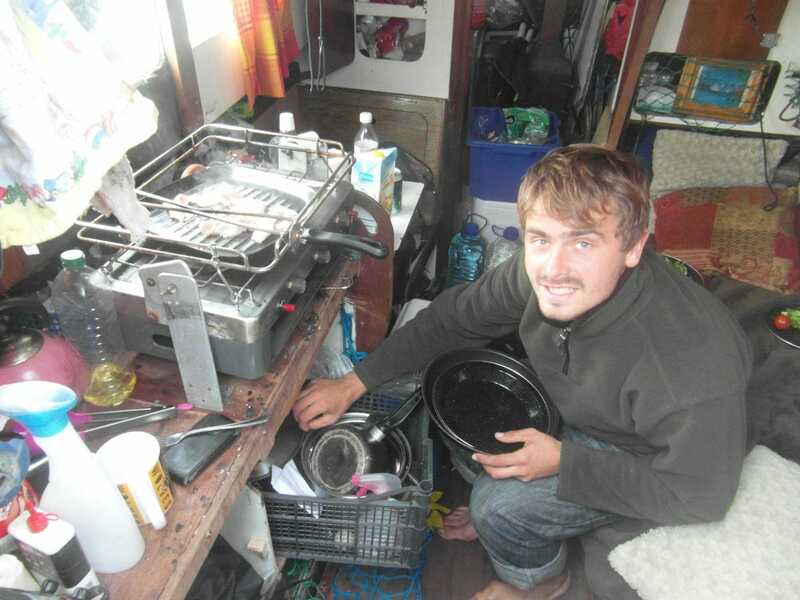 For money, he still worked at the hotel, using most of his spare cash to buy essentials like a heavier sleeping bag or solar panels for the boat so he could have electricity. His resourcefulness didn't end there. Pearce replaced the toilet with a wood-burning stove, which doubled as a heater when the cabin got to a numbing 17 degrees Fahrenheit. He cooked meals onboard, too, using drift wood from the nature reserve for fire. Pearce estimates that he saved Â£5,500 ($8,500 USD) by living off of his boat. It all paid off in the end. When he graduated with his Master's in December 2012, Pearce was dirt broke and totally debt-free. "I had the money to [travel] when most people come out of university with debt," he said. With his meager savings, he was able to afford a plane ticket to Greenland, where he spent time volunteering. After his return from Greenland, he settled back on The Golden Cloud and sailed the 500 miles home to the Isle of Wight off the coast of England. On his way home, Pearce raised somewhere around Â£400 ($600 USD) for Lifeboats and Isle of Wight Society for the Blind, two charities that helped his dad after he lost his vision. Now, Pearce hopes to join the Royal Navy as a hydrographer, but until then he plans to take The Golden Cloud on a few more adventures. "The boat is on a river close to the sea," he said. "I take my dad out fishing and in the long run I hope to do a lap of Britain." By the time Ken Ilgunas was wrapping up his last year of undergraduate studies at the University of Buffalo in 2005, he had no idea what kind of debt hole he'd dug himself into. He had majored in the least marketable fields of study possible â€“â€“ English and History â€“â€“ and had zero job prospects after getting turned down for no fewer than 25 paid internships. "That was a wake-up call," he told Business Insider. "I had this huge $32,000 student debt and at the time I was pushing carts at Home Depot, making $8 an hour. I was just getting kind of frantic." Instead, he moved to Alaska and spent two years paying back every dime. And when he enrolled at Duke University for graduate school later, he lived out of his van to be sure he wouldn't have to take out loans again. "I had no idea what I was getting into at the time. I didn't even know what interest was when I was 17," he said. "I just think that's awfully indicative of the incredibly poor personal finance education young people have at that time in their lives." In his book, "Walden on Wheels: On the Open Road from Debt to Freedom," Ken chronicles his journey out of debt. He was kind enough to share his story with us this week.